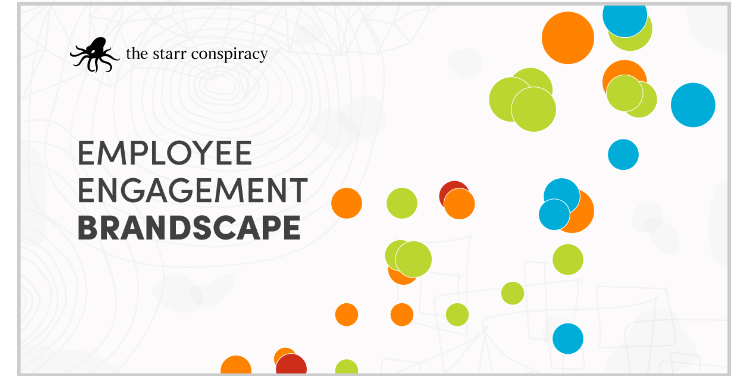 For anyone who still doubts the emergence of engagement, the 2016 Starr Conspiracy Employee Vendor Brandscape is a wakeup call. The detailed report is a must read for anyone involved in rewards and recognition, wellness, measurement, or any aspect of talent management, culture development and perks, and is summarized on the ESM portal. The complete report is available free at the Star Conspiracy website following a brief registration process. The report is great news for anyone in the employee engagement space, because it clearly places the field as “early stage” with “huge” potential. Read our recap and the full report and draw your own conclusions. A missing link. Although they do allude to the relationship between customer and employee engagement, the authors’ definition of the market doesn’t includes anything about engaging customers, distribution partners, salespeople, vendors and communities. This reflects the traditional silos that continue to plague a broader implementation of engagement at most companies. These other markets combined dwarf the employee engagement marketplace, even though they require very much the same tools and services. The research is clear: Organizations get the best results from engagement when they integrate their efforts to include all the various touchpoints and stakeholders, which is why the EEA calls the field “Enterprise Engagement.” Based on our marketplace definition combined with theirs, the Enterprise Engagement marketplace totals well over $100 billion. No clear definition. While correctly observing that the field lacks a definition, the report does not exactly provide one. For us, the general unwillingness by businesses to define the strategy is an excuse not to address it. 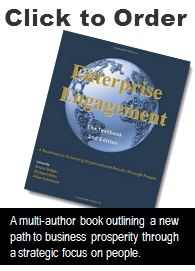 Since 2008, the EEA has defined engagement as “fostering the proactive involvement of everyone critical to success.” We give special thanks to author and consultant Don Peppers for his contribution here. The reason companies duck the issue is that they don’t know how to address it and, if they embark on the journey, discover it requires a relentless struggle to break down silos and establish consensus because of the lack of an agreed-upon definition and implementation framework. The wrong emphasis. The authors say that technology is at the heart of the transformation to what they call HR 2.0, and perhaps they are to be pardoned based on their company’s focus on technology. According to the research, the competitive edge is actually not technology, but rather creative and effective program design. Certainly technology is key, and their prescription for integrated engagement platforms is right on target, but at the end of the day what will drive results and the willingness of companies to pay for services is the ability to design and implement programs that effectively foster the proactive involvement of people to achieve key goals in a measurable way. The analogy to advertising applies; there are thousands of platforms to reach customers, and there will be multiple technology solutions that will be able to integrate engagement levers in one way or another. The key to success will be the strategy and execution. The authors identify rewards as an engagement component on a downward trend. We completely disagree. Abundant research now proves that rewards properly linked to performance and values are actually an under-utilized way of engaging people, especially when incorporated with other talent management strategies. Strategies that many companies hide for fear of appearing unethical should be touted as a way of enjoying success with everyone in the organization, not just top earners. What twisted logic allows executives to enjoy travel and wining and dining with customers and colleagues while everyone is scared of doing the same for all employees? These points aside, we applaud the team at the Starr Conspiracy for helping define this new field and recommend that anyone interested in this space follow their blog.